BloggerAid-Changing the Face of Famine is a fabulous group of international food bloggers who are "determined to make a difference in aid of world famine." Although I believe that there is something each and every one of us can do to help those less fortunate than we are both close to home and abroad, BloggerAid-CFF is on a mission to make a positive change all over the world by raising both money and awareness! One of the really cool aspects of BloggerAid-CFF is called BBFF...or BloggerAid Best Friends Forever. 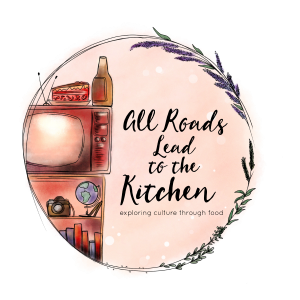 Members are pairing up with another member from a different country and getting to know one another through emails, blogging and dialogue; this is just one step in fostering an understanding in culture and cuisine we're not necessarily familiar with. I am one who yearns to travel...to absorb...to immerse...to learn and to respect and participate in other cultures and inevitably other cuisines, so I jumped on the chance to meet a new BBFF! If you are interested in joining BloggerAid- Changing the Face of Famine, please click on one of the links and get involved. Immediately! Without further ado, let me introduce you to my BBFF, Val. You may know her from her blog more than burnt toast, set in the breathtaking Bellini Valli...British Columbia, Canada. Val is one of the founders of BloggerAid-CFF and has a passion that flies from her fingers when she writes about the need to do something tangible to raise funds for the world famine & poverty crisis. Val grew up idolizing the Galloping Gourmet, collecting recipes and dreaming of throwing dinner parties (fostering her future foodie). When she moved out on her own, she began to experiment with food and realized that the blah and bland food that she grew up eating was not the food she wanted to continue to eat! 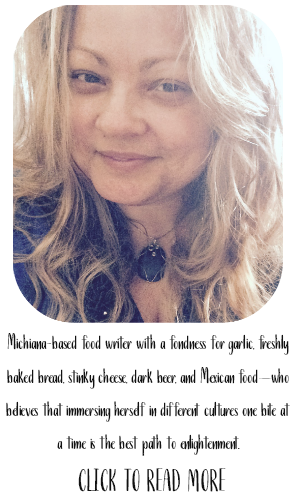 This girl discovered flavor...think Middle Eastern and Greek foods, which are her favorites. I wanted to make a dish that reflected one of Val's favorite foods today, so I decided on Falafel. I only recently tried it myself when a gal from Jerusalem (who I work with) brought some in for a guy who always asks her to bring them. My first try...and let me tell you...I loved them! I was hooked. I'd been wanting to actually make some myself and figured this was definitely the right time...I was waiting for this happy coincidence! I emailed an elementary school friend (Midwestern girl, met a man, converted to Judaism, married that man, moved to Israel, recently re-connected via the wonder-that-is-Facebook after 21 or so years, who has a blog-but doesn't update it very often) and asked if she had a good falafel recipe she could send me. She was more than willing to pass one on to me...along with a recipe for Matbucha (an awesome relish-like dish) that I served up with it...along with an Israeli Salad. So Val, this plate's for you! Falafel Plate by girlichef- slightly altered from an old friends recipe Falafel yield: ~4 dozen falafel 2 cups dried chickpeas (soak them overnight in water first) 5 cloves minced garlic small handful Parsley small handful Cilantro Juice of 1 1/2 Lemons 3 Tbs. tahini 1/2 tsp. turmeric 1 tsp. cumin 1 1/2 tsp. sea salt 2 eggs 4 slices bread (whizzed in food processor into fine crumbs) Drain any excess water from chickpeas. Place in the bowl of a food processor with all ingredients except eggs and bread crumbs. Grind well. Taste for seasoning and adjust to taste. Add eggs and bread crumbs and process again to combine. Mixture should be firm enough to hold together. Transfer to a bowl, cover and place in refrigerator for at least 1 hour to make it easier to work with. Heat ~1 1/2" of vegetable oil in large skillet w/ sides. Using a 1 Tbs. measure, scoop mixture then form into balls using wet hands. You may leave them in balls or flatten them into disks. Fry until golden on each side, turning halfway through in batches. Transfer to paper towel lines plate to drain. 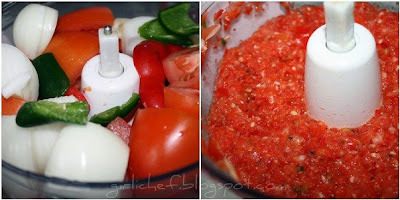 In the meantime, make your: Matbucha (pron.- maht boo kha) 3 medium red bell peppers 1 medium onion 4 Roma tomatoes 1 jalapeno 4 cloves of garlic Olive Oil 2 Tbs. 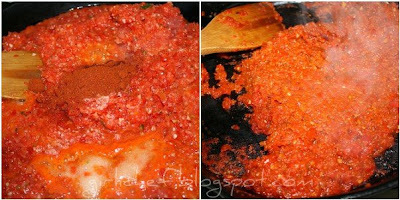 Paprika 1 tsp. Sea Salt Blend first 5 ingredients in food processor until well-chopped. Heat a skillet over medium-high and add a good coating of olive oil to the bottom. Pour in mixture and add paprika and salt. 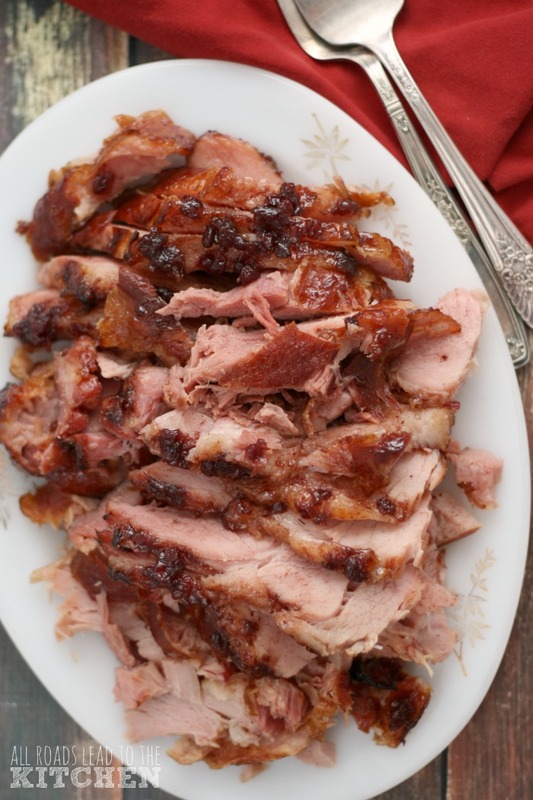 Let it cook down until almost all of the liquid has evaporated and it becomes relish-like. Set aside. 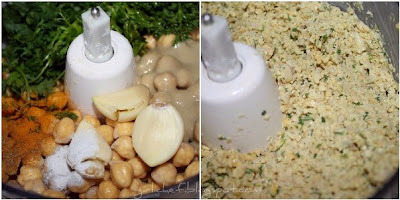 Next make some Hummus. 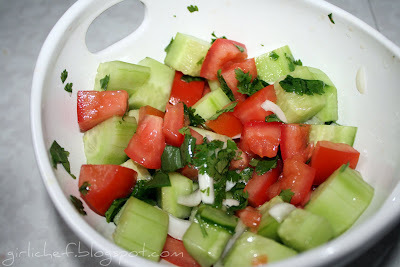 Then make a quick: Israeli Salad 1 cucumber, peeled & chopped 2 tomatoes, core, seed & chop 1/2 small onion, slice thin good handful of cilantro, chop juice of 1/2-1 lemon olive oil sea salt Toss together veggies & cilantro. Add a glug of olive oil and squeeze in lemon juice to taste. Season with salt. Toss again. Okay, toast up some pitas until warm and fragrant. Cut if you wish. Serve all together...pile your Matbucha onto your hummus. Eat all separately... Or pile together into the pita. Enjoy! It has really been a joy getting to know Val. We obviously have that common thread of being foodies and bloggers ...but we also both want to take a culinary tour of the world!!! Since this is tops on my "to do before I die list", I was very excited to learn that it is also one of Val's goals. Maybe one day we can meet up in some other country and take a leg of our culinary education tour together! Oh my golly, this is one of my favorite's in the whole world! I really should try and make it sometime! Great photos! I signed up for Blogger Aid and I was sent a link but couldn't open it. I really want to find out more about how I can help with this! This is scrumptious! I made Falafel once with canned chickpeas...whew, couldn't pack them into the flatbread (I should make them bigger). This is just excellent! I've never had falafel, but will try sooner or later. I'll definitely check about Blogger-Aid thing. This looks justdelectable. I would LOVE to try this. How do you constantly outdo yourself? I've never seen this recipes. Looks fabulous! I looove falafel. I used to salivate every time I thought about getting falafel from this food truck in Philly, Pa. when I lived there. You did a good job representing Val's culinary point-of-view. YUM!!!! 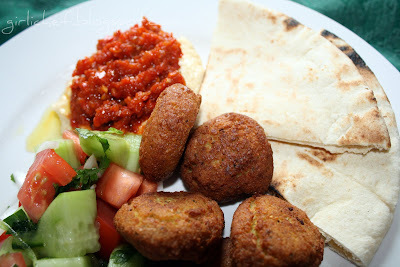 I only recently discovered falafel too... and I LOVE it!! Everything you made looks awesome!! Really great post...I could tuck into some of that yummy looking chow for lunch today. Such a neat and fun idea! All of those dises look great! So fun to try new recipes from different cultures! I've never tried falafel, but would really like to! 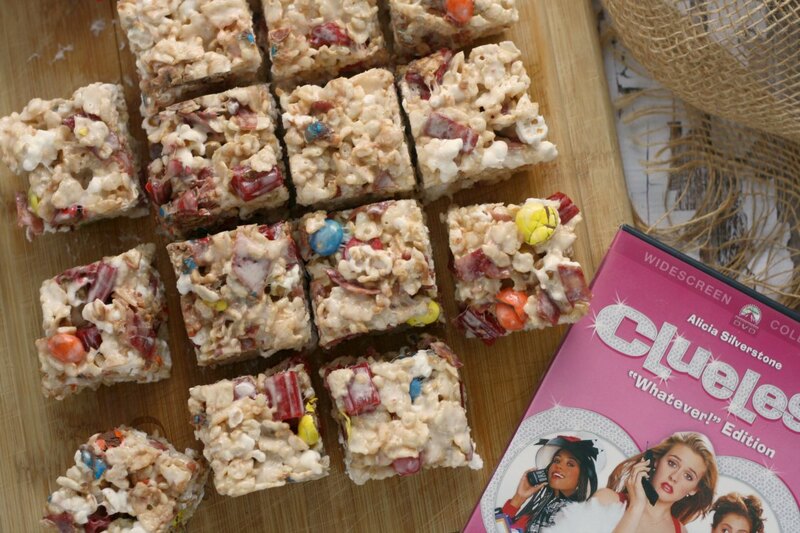 Thanks for sharing the recipe...your picture looks delicious! Those pictures are mouthwatering. 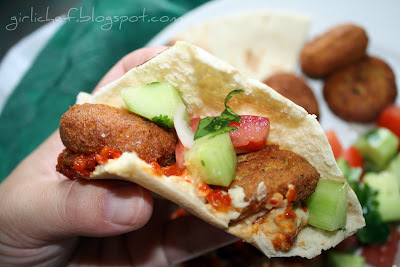 I've never had falafel but it looks delicious.. I have never had falafel before - now I need to! I am salivating as I look at your pics. and reading the ingredient list. Absolutely fresh and palate pleasing! Thanks for the cool read on blogger aid! Really would like to contribute too! These falafels look scrumptious! Yum! I've never had matbucha--my curiousity is piqued! Falafel and Hummus are just two of my very best favorite things. (oh yes I'm singing:) However, I have never experience Matbucha...You've won my heart with your blog and my belly with your recipes. Amazing!!! This all looks so Yummus! Okay bad giggle, but hey it does look good, and while I am in Texas I need to go visit one of their good Mediterranean restaurant! You do out do yourself! BloggerAid is a great cause and Val is a gem herself. Glad you two hooked up and great, great job on cooking up some stuff in honor of her tastes! I love falafel too!! 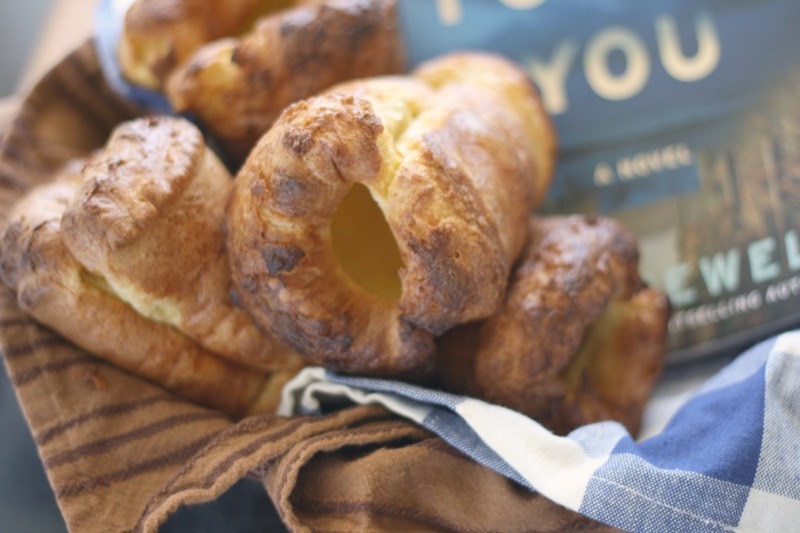 These are perfect golden brown beauties - how delicious! And blogger aid sounds great - love the BBFF idea! girlfriend, you could open a restaurant! Where do you find the time to be as involved as you are? Holy Cow. I've never had Falafel... it looks good, I'll have to try it. This is the question of the day for you. READY? How do you do all this and do it beyond awesome? I am going to wait until you answer me! Seriously, you are awesome! AND by the way, everything looks delicious. Incredible! I'll have to try the Matbucha! How exotic! Looks wonderful! So summery. I am a big fan of Val's blog too. And she is Canadian! 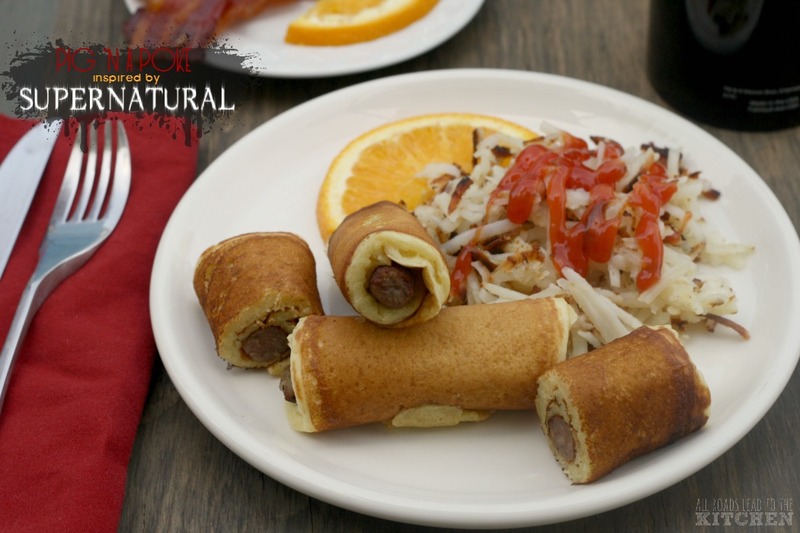 This looks so traditional and tasty :), how cool that you were able to get it form a friend you recently reconnected with. Ah the wonders of the internet. This is a feast! It all looks so good! I think I've only had falafel once, and I'm pretty sure that it was on a sandwich, which sounds weird to me now. I would love to try all of this! Good work! 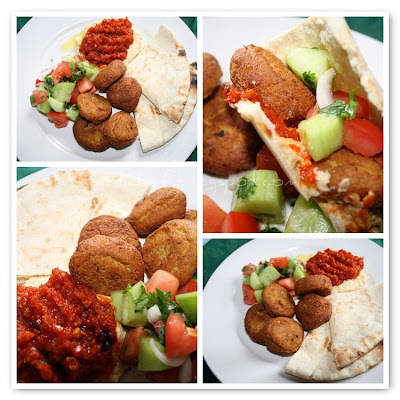 That is some great looking falafel--the whole plate looks delicious. It's fun that you got to know another blogger better too. Bloggeraid and Val....the best. I've never had falafel but now I've got to try it. A culinary tour around the world! Watch out, world! Heather and Val will come to conquer with their empty stomachs and hungry souls! and wow...this looks freaking awesome. I LOVE falafel. God, I love falafel. Thanks for sharing this. I'll definitely try it. This is my favorite type of food. I actually watched a friend make them from scratch this past weekend. They were so good because they were homemade! I LOVE Falafel! And it is another one of those dishes that I haven't made for years! 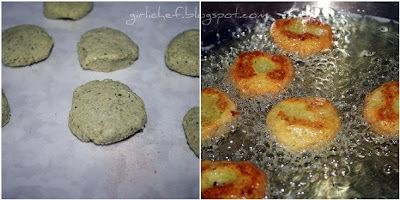 I will most definitely try this recipe as those falafel look outrageous! And I admit that though I serve mine with Hummus, mine has definitely been missing Matbucha!